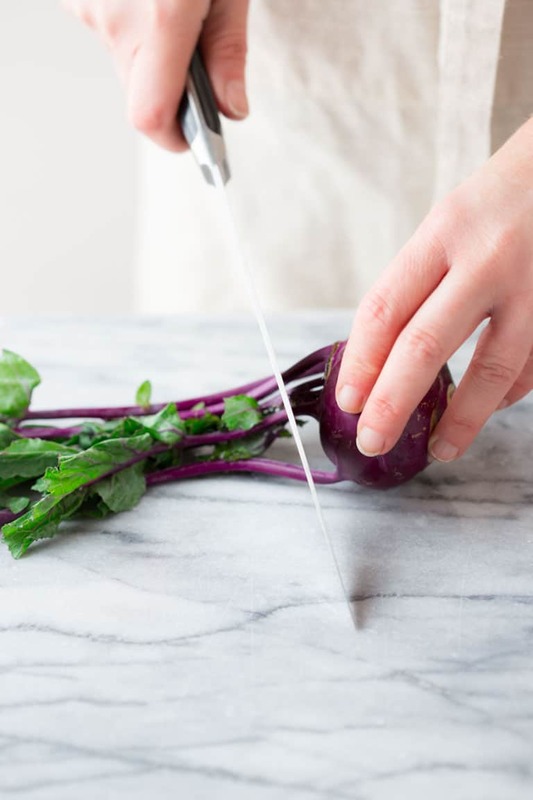 Today’s Produce Spotlight is the Ultimate Guide to Kohlrabi. We are going to be covering everything you want to know about kohlrabi, and more! I will show you how to peel and cut the tough skin away. How to cook it, how it tastes, and what to pair with it. I also have detailed information for gardeners about how to grow Kohlrabi at home plus nutritional information and why it’s good for you. What is the origin of Kohlrabi? The word “kohlrabi” is German in origin, “kohl” meaning cabbage and “rübe” meaning turnip. The botanical origins of this species can only be traced back about 500 years ago to Europe, although some suspect the species is older than that but because of confusion around its definition and strange aesthetic, it is hard to pin down. Although early in its classification it was thought to be a cross between a cabbage and a turnip (thus the German translation of the name), we can be certain that its genetics stem from the same common wild cabbage parent as cabbage, kale, broccoli and cauliflower, and not from the turnip family or any other root vegetable. 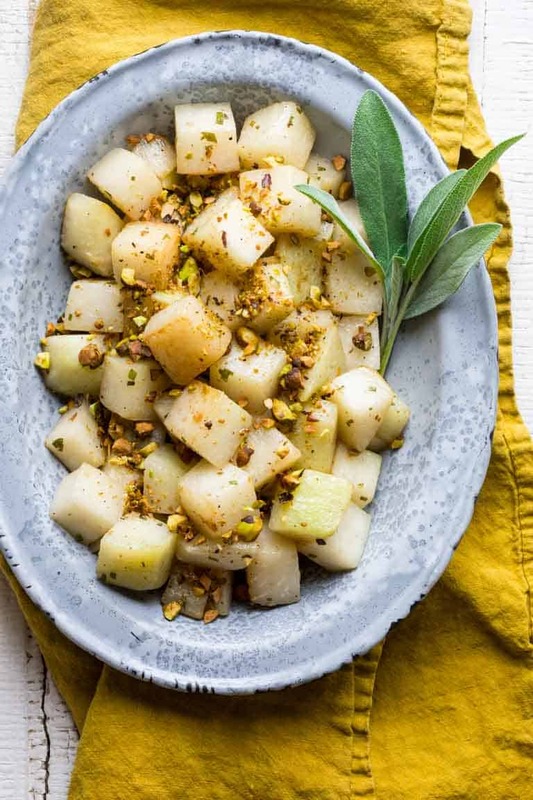 Is Kohlrabi a Root Vegetable? Nope. 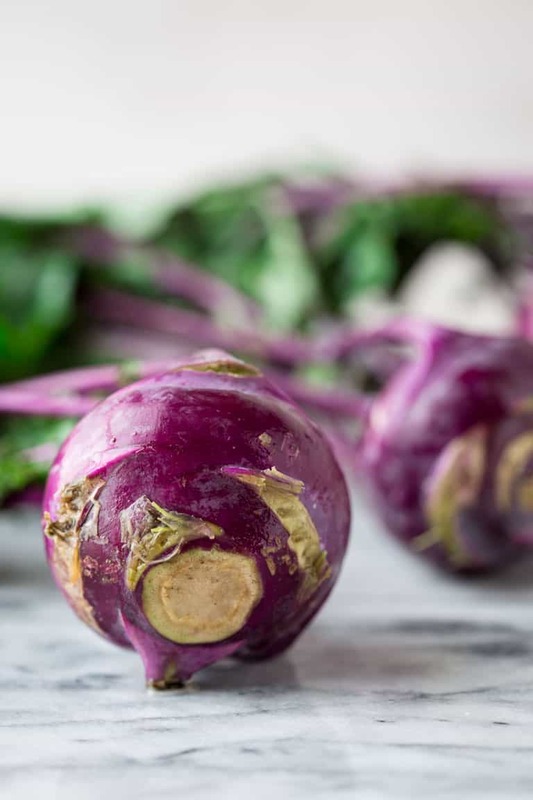 While there is a common misconception that kohlrabi is a root vegetable, it is in fact grown above ground and is the swollen stem of the plant, or corm. Kohlrabi is a brassica and is cruciferous. Kohlrabi is either green or purple. Inside they are pale greenish white. The color does not change the flavor. Here’s what you need to know about when to sow the seeds (by zone or frost date.) Kohlrabi is a cool season biennial in the Brassicaceae family, preferring cool temperatures to extreme heat. Kohlrabi seeds can germinate from 45°F-85°F; plants thrive in cool weather like the fall daytime/nighttime temperatures of the Midwest and northeast. Kohlrabi can be grown in almost any region or planting zone, as long as it is planned for the shoulder seasons (i.e. fall and spring). It does not perform well in extreme heat and cannot tolerate repeated freezing. In regions with the mildest winters, kohlrabi can in some cases be grown through the winter. Start seeds for transplants 4-6 weeks before planting date (first planting date can be 1-2 weeks before last frost), or direct sow the seeds as soon as the ground can be worked in the spring (~2-4 weeks before last frost). Succession plantings can be transplanted up to 8 weeks before the first frost. Plants will withstand light frosts, but repeated freezing will negatively affect the texture and storability of the plant. For most varieteies, allow 50-65 days after planting for the crops to reach full maturity. Kohlrabi can be grown in almost any region or planting zone, from Maine to Georgia and from Oregon to Texas, as long as it is planned for the shoulder seasons (i.e. fall and spring). It does not perform well in extreme heat and cannot tolerate repeated freezing. In regions with the mildest winters, kohlrabi can in some cases be grown through the winter. Plants will withstand light frosts, but repeated freezing will negatively affect the texture and storability of the plant. Kohlrabi requires well drained soil with a pH of 6.0-7.5 and prefers full sun. Water evenly but not excessively throughout the growing season for best results. Kohlrabi responds well to fertilization with high N-P-K ratios, but be careful not to over fertilize which can result in splitting or excessive vegetative growth. What causes Kohlrabi to split? The splitting of the swollen stem usually represents rapid vegetative growth. Several factors can cause this. If the plant experiences drought followed by heavy watering or rain, rapid plant growth combined with excessive water uptake can cause splitting. Excess nitrogen uptake, particularly towards the end of the plant’s maturity, can also cause rapid growth and swelling which can result in cracking. This can be avoided by applying even fertilization during plant growth and avoiding over fertilizing, especially in the last few weeks of growth. Splitting is also commonly seen when the plant is oversaturated with water, if it has been a particularly wet growing season. When is Kohlrabi ripe/ what season is Kohlrabi harvested? Kohlrabi is harvested from spring to fall (ranging from 45 to 65 days to maturity.) Here in Vermont that is June through September. Most Kohlrabi varieties are ready to harvest when the stem swells to 3-5” and is easily visible above the soil. Some varieties, like Kossak F1, have been bred to reach a much larger size and are ready when the stem has swollen to 8-10”. It is important to know the ideal harvest size based on variety, because harvesting too late can result in a woody texture that is not as pleasant to eat. Your seed company should provide the harvest size in the variety description when you purchase your seed. 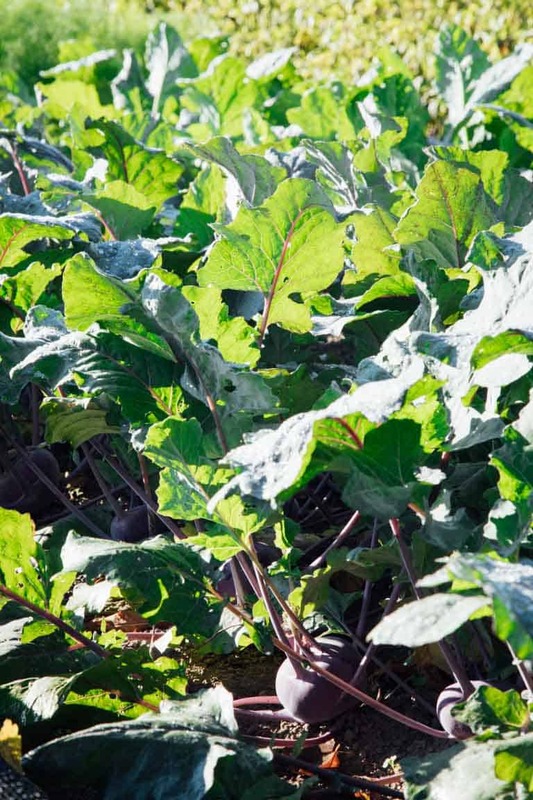 Can you can eat Kohlrabi Greens? The greens of any kohlrabi plant are 100% edible. They taste very similar to broccoli greens, and are quite tender, especially earlier in the growing season. You can even grow them as a microgreen. 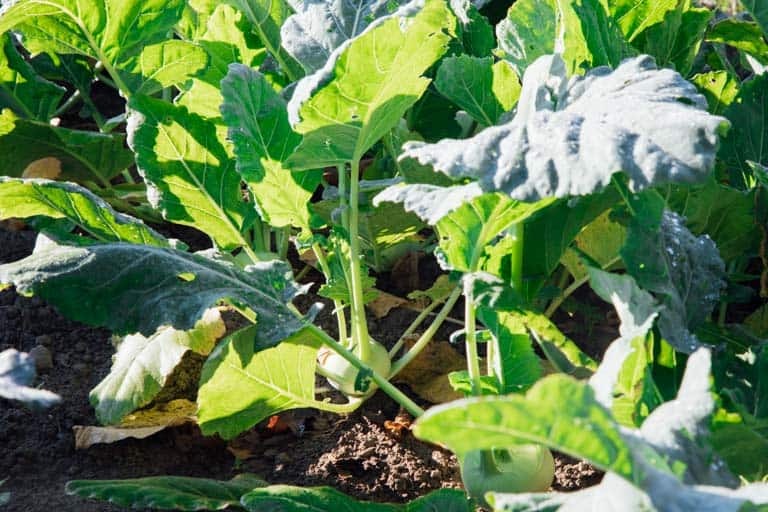 However, if you wish to grow kohlrabi for the greens, it is wise to use some sort of floating row cover to protect them from flea beetles, which will chew tiny holes in the leaves, making them very unattractive and sometimes damaging the plant’s photosynthesis capabilities significantly. See more about buying kohlrabi, and when you’ll find kohlrabi with the greens attached below in the Buying Tips section. Plants will withstand light frosts, but repeated freezing will negatively affect the texture and storability of the plant. SOURCE: The above information in this SEASONALITY AND GROWING section in this post was provided by High Mowing Organic Seeds. I am a big fan of their seeds (they are an awesome Vermont company after all) and I use them in my garden. I was not compensated to reference them. If you are a gardner, I also want to give a shout out to this tool on the High Mowing Seeds blog. It tells you when to plant certain crops based on their planting zone. Why is Kohlrabi Good For you. Kohlrabi is only 35 calories per cup. Though it looks like a root vegetable, it is not, and it is not starchy. Kohlrabi is Low Glycemic, which means it does not cause rapid blood sugar spikes. Kohlrabi is an excellent source of vitamin C and potassium. It is high in fiber (5 grams per cup) which helps you feel fuller longer, and is great for your digestive health. Cruciferous veggies, of which kohlrabi is one, are known for their high levels of antioxidants which help fight cancer and heart disease. 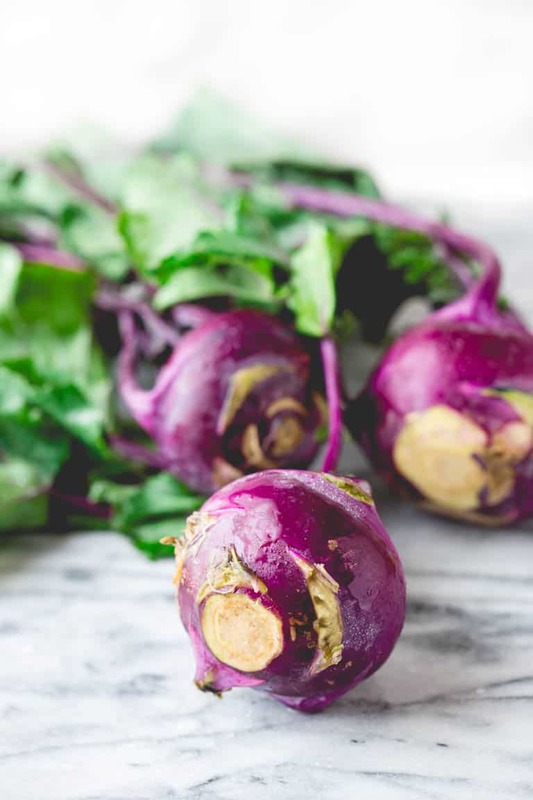 While kohlrabi is not considered Low FODMAP, in small amounts it may be tolerated for those on a low FODMAP diet. Look for kohlrabi at the Farmers’ market or in the refrigerated section of the produce section of good supermarkets and health food stores. It is often along side the root vegetables, such as turnips and daikon radish. Or if the leaves are still attached, it can be found with the broccoli or leaf vegetables. 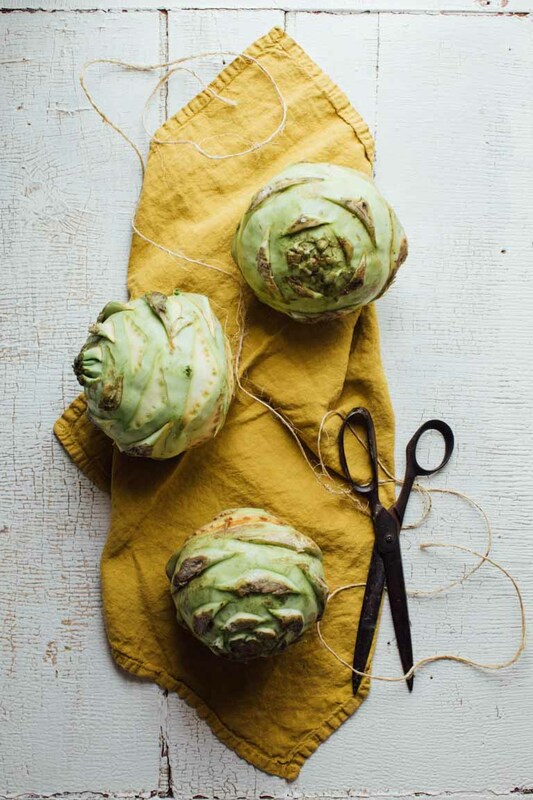 According to Mara Welton of Half Pint Farm in Burlington Vermont, the most likely time you’d see greens on kohlrabi at the market are in the spring, as the leaves are super tender then, versus the sun-toughening summer months when they can look pretty gnarly. Most of the rest of the year, you’ll find them with only the stems or completely trimmed. Look for bulbs without splits, rot or mildew. If you have a root cellar, first of all, I am totally jelly, and second of all- keep your kohlrabi in it for the winter. It is an excellent storing crop which makes it a common vegetable for winter CSAs. Keep dry and cold for storage through much of the winter. Conservatively speaking you can store in the refrigerator for a month, but really you can keep it longer if space permits! Many CSAs with good cold storage will provide a steady ration of kohlrabi into the early spring. I keep it in re-sealable produce bag, and just check to make sure there isn’t any excess condensation inside the bag. If you were to ask me to describe Kohlrabi, I would say it tastes like peeled broccoli stem. It is actually very similar in color inside as well: Very pale whiteish green. It is a little peppery, like a very mild turnip or radish. The texture is very crisp, and some varieties are flat out juicy- almost like an apple. Kohlrabi has subtle sulfur notes typical of cruciferous vegetables. Don’t let that scare you off! See below flavor pairing ideas. I made you a video so you can see! Start by cutting the touch root end off with a sharp Chef’s knife. Use a sharp pairing knife to trim off the outer skin. If you have a really good vegetable peeler, you can use that instead. If using the peeler, make sure to peel enough away so as to remove any visibly fibrous skin. 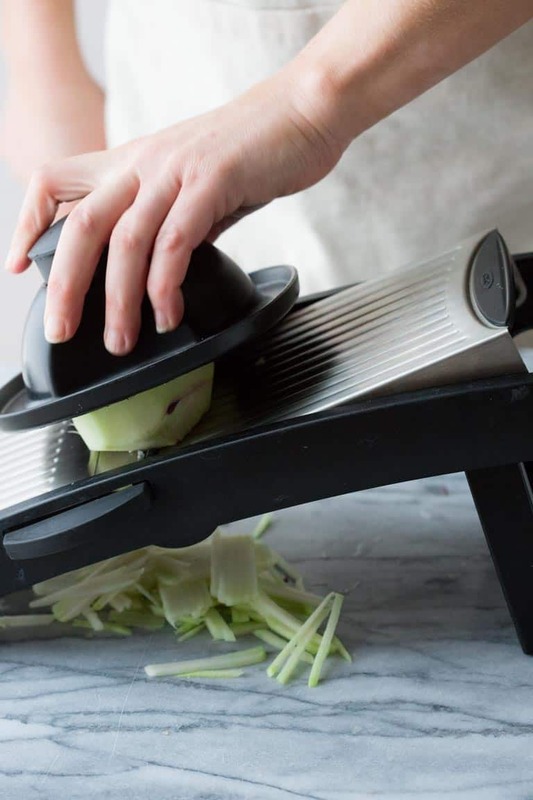 My video shows how to dice the kohlrabi, but you can also shred it with a box grater or cut it into julienne strips by hand or with a mandoline. Kohlrabi is delicious eaten raw, but it can also be cooked. Because it is dense, firm and relatively low in water content, grilling is not the greatest way to bring out its best qualities. It is better suited to steaming, sauteeing and roasting. 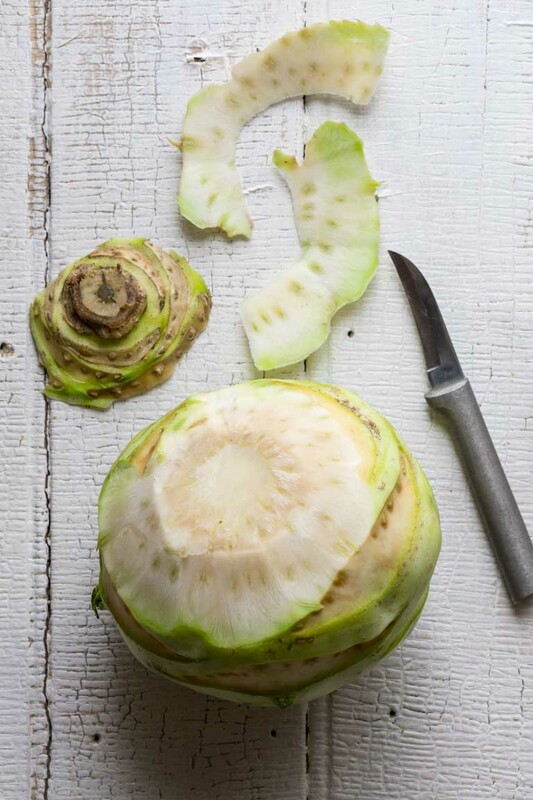 Depending on the size of the cuts, steam diced kohlrabi 5 to 6 minutes, or until crisp tender. Kohlrabi pairs well, in general, with ingredients that other brassicas and cruciferous vegetables pair well with. Kohlrabi and bacon go great together. Kohlrabi and acidity are also well paired. I love the way raw kohlrabi tastes with lemon juice salad dressing. When raw, creamy elements such as mayonnaise, Greek yogurt and sour cream are often a nice counterbalance to the slightly peppery flavor. When cooked, it is often sweeter, so contrasting elements such as cheese or herbacious flavors such as oregano or dill are very nice. Hollandaise sauce and cheese sauce are delicious with steamed or roasted kohlrabi. 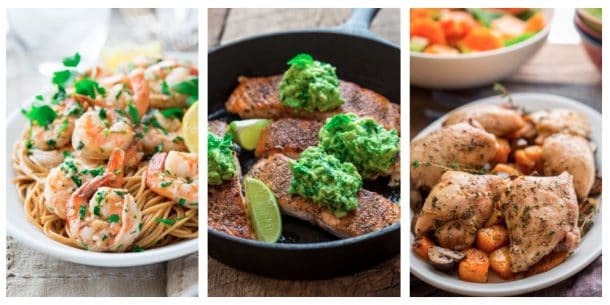 If you haven’t already, please make sure you sign up for my email news letter so you never miss another healthy recipe, produce spotlight or weeknight meal. I wish I could find some purple kohlrabi here…have never seen them, not even in our local farmer market. Love that salad with the egg! Kohlrabi grows really well here in Vermont, so we do see the purple varieties pretty commonly. But the good news for you is, that it tastes just like the green kind. This is such an informative post Katie — I love it! I just used some green kohlrabi yesterday in my kale salad and it’s so delicious. I’ve never cooked it believe it or not so I need to try that next! My monthly spotlight series will be starting up soon this year too…I guess we had the same idea! That’s amazing Marcie! I am so glad to hear it! 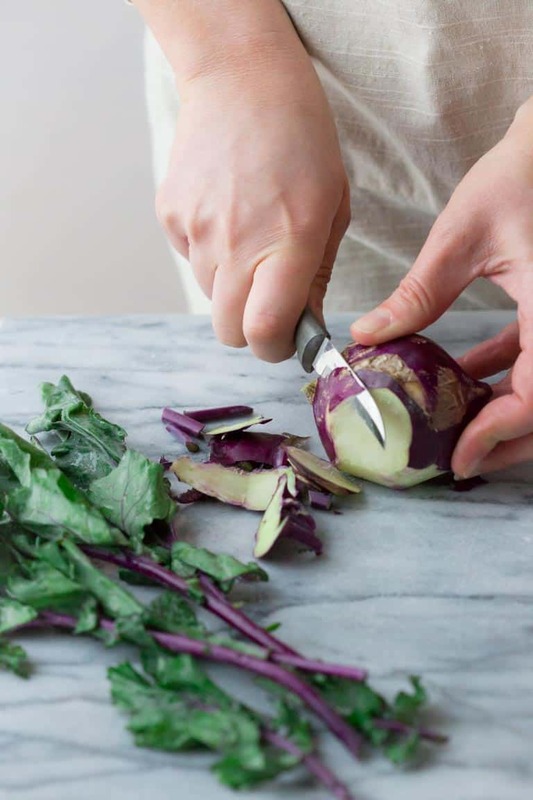 What a great tutorial about growing, peeling and cooking Kohlrabi. My mother used to make it when I was young, but I have never really been inspired to do anything with it until now. Thanks for the new post and the new series. I’m so glad to hear that this is inspiring to you. That’s my hope for this series. My husband’s aunt grows tons of kohlrabi so I’ve eaten it a few times but I had no idea there were so many things you could do with it! Cool- I love having friends/family with great gardens. My mom is always gifting me with her bounty. Yes, it is pretty versatile- which was one of the points I wanted people to take away from this. So I am glad you said so. Have an awesome day Liz. I could not have come across this at a better time! I’m just about to embark on working with kohlrabi and was wanting to do some research about. Everything I wanted to know is your this super informative post. Thank you! That’s so great to hear! I hope you enjoy working with it. Once you peel it- it’s quite versatile. Thank you for all the helpful information, it’s a vegetable I have overlooked at the grocery store for years because I had no idea what to do with it. The picture with the egg on top looks fantastic. Juli- so glad to know you’ve maybe gotten some ideas for what to try now. The bistro salad with the poached egg is a great place to try it out! I mean you can’t go wrong with a yummy runny yolk! 😉 Have a great day. What a fantastic article on such an under-utilized vegetable. 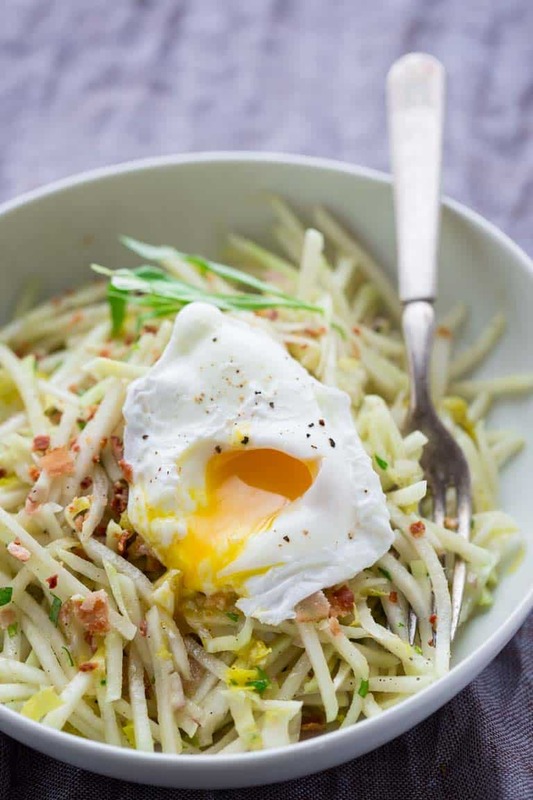 I especially love the idea of julienned strips of kohlrabi. I’ve learned so much! The julienne strips are my favorite way to enjoy it raw- because it is so crunchy! This is so helpful. I had heard about kohlrabi but knew barely anything about it. I’m definitely going to be seeking some out to cook with now! That’s music to my ears Bintu! I love the idea of kohlrabi getting a bit more love as it’s a great storing crop. So pleased to read this tutorial because I now know what to do with it should I be lucky enough to find it in the market. Another vegetable to add to the menu. Thanks for giving me the knowledge! I’m psyched to hear you appreciate the post, and that it may help out when it comes time to buy and cook it! That’s exactly what I was hoping for. This is a fabulous new blog format. Everything you need to know about …. Thank you. Hi Paul. I hope you’re well. Thanks so much. I am glad to know that you like it. It’s a little outside the usual for me, but I am really excited by the positive feedback so far. I can’t wait to see the series progress. Let me know if you have any requests! Have a great day. Thank you so much for this informative article. You obviously put a lot of research and time into it. I tried a fresh kohlrabi once, fell in love, and tried to grow it last Spring. But, it didn’t grow for me (I will definitely try your hints this next time). I still have seeds and hope! 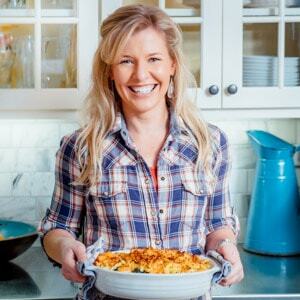 I love your blog and am so grateful for all you do for us. Thank you and blessings to you.